After World War Two, thousands of British families were sent packages of food from strangers in the US. But nine-year-old Joseph Briddock and his family were given something unexpected. Seven decades later he is still keeping it safe. Joseph Briddock does not remember the box arriving but he remembers the moment it was opened. "Some things came out that we had never seen before," he says. The box had been sent from the US and was stuffed full of tins of corned beef, powdered egg, sugar and chocolate. "I remember getting out these little boxes of cornflakes and my mother opening them and the smell just hit you. It was so beautiful." Stamped on the side of the box was the word "Care". Set up in 1945, the Co-operative for American Remittances to Europe started a scheme where people in the US paid $10 to send a parcel to families who had been hit hard by the war. Thousands of people in the UK received Care packages. Most were filled with food but in one of the boxes sent to Briddock's family there was something unexpected - a patchwork quilt. "I remember opening it up and just being absolutely overcome by it," he says. The quilt had been sent by the Methodist Ladies of New York. All of the Care packages helped to brighten the days at the end of the war, but for Briddock's mother Annie this was different. "It was a real quality thing to get," he explains. "It was so warm and luxurious and they had lost a lot of stuff because we were bombed out three times." Briddock, now 79, still remembers the nights they were forced to hide in the air-raid shelter at the bottom of their garden. There they would wait, listening to the noises overhead. "There was always an inch of water on the floor and the smell, that damp smell that came up at you all the time," he says. "We weren't allowed to put our backs on the wall of the shelter because it was said that if a bomb dropped nearby, the vibrations could break your back." When that night's bombing was over the family would climb back outside. Sometimes the house was damaged, sometimes it was not. But their Anderson shelter could not protect them from every attack. In 1943, the whole family was caught in the open as a German fighter plane appeared at roof level, shooting as it flew. "We were all sort of scattered. I ran into the doorway of a house and my mother ran into a front garden and lay on my sister." They survived, but the pilot went on to kill 38 children and six teachers at Sandhurst Road School in Catford, south-east London. Sandhurst Road School was bombed on 20 January 1943. It destroyed the whole central part of the four-storey school where many children were having lunch. The headteacher Margaret Clarke said at the time: "The only question the children were asking was: 'How can we help Miss?' They took home the younger ones, tore up their clothing to bind the injuries and even helped with the rescue work — a grim job for youngsters of 14 and 15." Despite the dangers, Briddock says he felt safe. His mother had heard stories about the abuse of evacuees and had kept her children with her while her husband was away fighting in North Africa. "She did all the hard work during the war," says Briddock. "She was a bit of a battler." He still remembers the time his mother tried to get the family their ration of bananas after the war. The grocer was strict, he explains. He made the women line up along the shop so he could dish out two bananas per ration book. "Some of the ones which my mother got were bad and she wouldn't take them. But the grocer just said that she had to take the good with the bad. So, she gave him half Egyptian money that my dad had sent over and half English money and told him to take the good with the bad too." It was his mother who saved the quilt. She kept it with her for 30 years until her death in 1978. Her son found it at her house afterwards and took it home. "I've got massive feelings of connection with that time so it's something I would never have let go," he explains. Image caption A Care assistant delivers a package to 14-year-old George, 12-year-old June, seven-year-old Gerald, four-year-old David, three-year-old Michael and 14-month-old Brian. The quilt acts as a reminder of what people were prepared to do for each other during the war. "I remember when the war was finished, my mother said 'Now everybody will get snobby again' and she was kind of right. "People stopped doing things for each other to some extent but during that time I believe it was fantastic what people did and gave up for each other." The quilt has become something of an heirloom and his family plan to keep it safe until it can be returned to the women who made it. 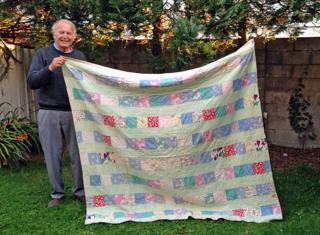 Briddock has never found them but he has often thought of what he would say if did: "I would tell them that they could never have any idea of the effect and the long term memories that that quilt created. "We thought about those ladies painstakingly making it and we loved it and revered it and we've treasured it." It may only have been a small gift, he says. But it had a massive effect.